Ricoh has introduced its weather-resistant K-S2 dSLR with a 20-megapixel CMOS sensor without an anti-aliasing filter, body-based image stabilization, built-in WiFi/NFC connectivity and a 3.0-inch articulated LCD. The standard kit includes a newly designed Retractable Standard Zoom lens that measures less than 1.5 inches in height when retracted to make one of the smallest dSLR camera kits available. "The Pentax K-S2 takes the best of all our innovations and combines them into the ultimate family dSLR," says Jim Malcolm, president of Ricoh Imaging America Corp. "The K-S2 has everything to capture the active family, including Pentax legendary quality, compactness, weather resistance and built in WiFi to easily share with family and friends. We are fulfilling our promise to deliver the highest quality and innovation imaging products." Clarity Enhancement, introduced with the K-S2, adds "more realistic texture impression to your imagery," the company said. It is applied automatically on Advanced HDR and also user-selectable for most still images on the setting menu. Image Sync, a free dedicated Android and iOS app communicates with the built-in WiFi/NFC module to provide remotely control of the camera, transfer images and share images on social networks. To connect the camera to a smartphone or tablet with built-in Near Field Communication just bring the K-S2 in to close proximity of the target device for pairing. The K-S2 will be available in black, white and graphite with an orange accent. An additional seven color options in two outdoor-themed collections will be available in April. 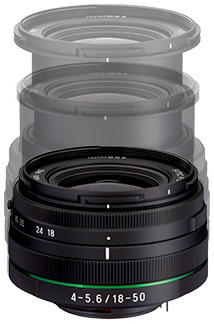 Ricoh said the K-S2 with the retractable standard zoom lens will be available in standard colors at retailers nationwide and at http://www.us.ricoh-imaging.com in March for a suggested retail price of $799.95. Color collections will be available in April. You can preorder from Adorama now using our affiliate links. For more information see the news release below. For more information see the news release below. DENVER, Colo. -- Building on our legacy of durable SLR cameras, Ricoh Imaging Americas Corp. is pleased to announce the launch of the Pentax K-S2; featuring a 20-megapixel AA Filter-less CMOS sensor with Prime MII image processing engine. 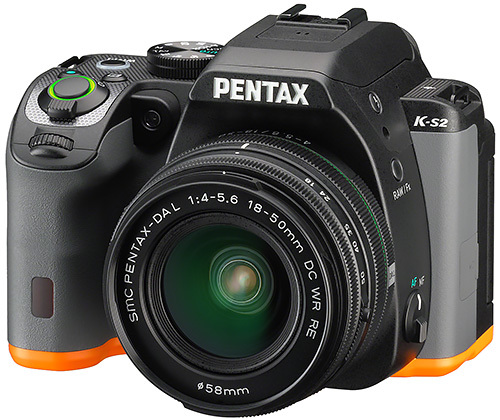 The Pentax K-S2 offers high image quality and functionality ensuring consistent and compelling results shot-to-shot. The camera's weather-resistant body, built-in WiFi and NFC sharing component make it a perfect companion for active families and those who simply enjoy life's adventures. The standard kit includes the newly designed, ultra-sleek, Retractable Standard Zoom lens that measures less than 1.5 inches in height when retracted, making it one of the smallest dSLR camera kits on the market. The new Pentax K-S2 combines a compact, lightweight body with many advanced features including Pentax's award winning weather-resistant design, in-body shake reduction, as well as SAFOX x AF system ensuring fast and accurate autofocusing even in challenging situations such as low light, action and adverse weather conditions. Various viewing angles are achieved with the vari-angle 3.0 inch LCD, 921K dots (RGB+White) and Air Gapless Construction. With the all-new Self Shot Assist users can capture the perfect "selfie". The K-S2 camera's vari-angle LCD monitor and 2nd shutter release button assist you in conveniently capturing the best self-shot. Sharing favorite images with friends and family is made easy with built-in WiFi and built-in NFC module. Along with the dedicated app, Image Sync, available for no additional cost in the Android and iOS stores you can seamlessly remotely operate the camera, transfer images and share images from your camera to your favorite social networks. Connecting your camera to your smartphone or tablet is made simple with built-in Near Field Communication; just bring the K-S2 in to close proximity of the target device for pairing. The Clarity Enhancement feature, introduced with the K-S2, adds more realistic texture impression to your imagery. This technology covers broader and more gradual tone changes of the subject since it was originally developed to reproduce the images that best match the whole screen on a display device. Clarity Enhancement is applied automatically on Advanced HDR and also user-selectable for most still images on the setting menu. The K-S2 will be available in 3 standard colors: black, white and graphite with an orange accent. Ricoh Imaging is also pleased to announce additional color collections for its new Pentax K-S2 dSLR camera. The Pentax K-S2 offers a choice of seven color options in two outdoor-themed collections: three in the Nature Collection; Forest Green, Desert Beige and Stone Gray as well as four in the Sports Collection: White and Lime, Black and Pink, White with a Racing Stripe and Black with a Racing Stripe. The Pentax K-S2 kit including a new retractable standard zoom lens will be available in standard colors at retailers nationwide and at http://www.us.ricoh-imaging.com in March for a suggested retail price of $799.95. Color collections will be available in April.